Thank you for your interest in Fantasy Ranch Horseback Adventures. 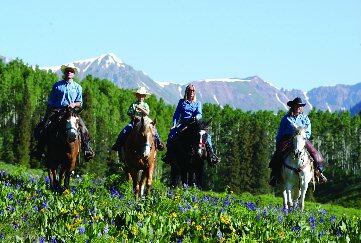 We offer a variety of horseback riding through the mountains and valleys of the Colorado back-country. Our specialty is the trailrides on Snodgrass Mountain from our stables in Mt.Crested Butte, but for those who would like a little more adventure we can load the horses in a trailer and head out for a wilderness adventure. Our experienced wranglers and horses can show you the time of your life! Your Fantasies are sure to be fulfilled here.